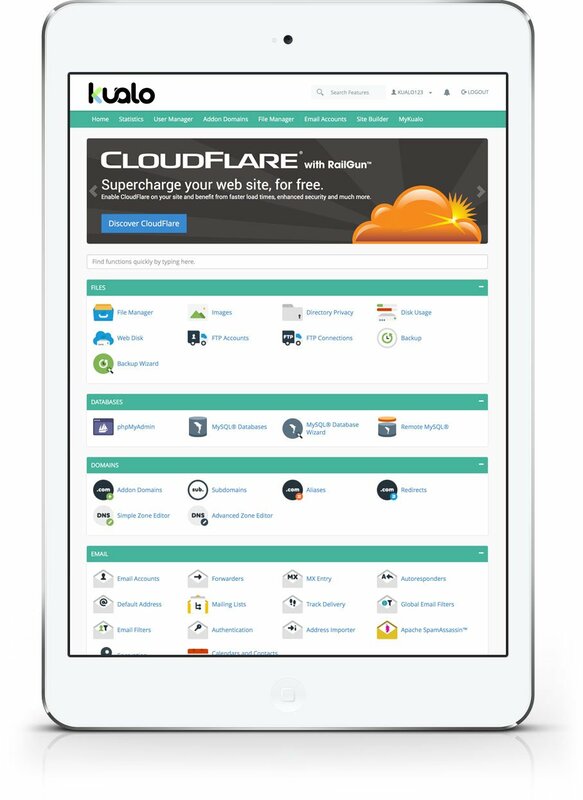 Discover cPanel, the world's number one control panel. The industry's leading control panel, cPanel, allows you to administer every facet of your website using simple, point-and-click software. Create email accounts, forwarders, and autoresponders as well as account and user-level filtering to manage email. Fight spam with SpamAssassin and email authentication. Then, use mailing lists to broadcast your message. Set up subdomains, addon domains, aliased domains, and redirects to point visitors in the right direction. Easily adjust underlying DNS records with the Simple DNS Zone Editor or Advanced DNS Zone Editor. Take advantage of over 300 third-party apps for blogs, bulletin boards, guest books, eCommerce, and more to build more robust, dynamic sites. All installed in an instant! Create MySQL databases and users, grant permissions and manage the database contents using the industry-standard phpMyAdmin software. Know your audience and track your website's performance using AWStats. View detailed PHP error logs and raw access logs. Configure password-protected directories, IP address denials, SSL/TLS, and GnuPG key settings to restrict access. Protect your site with HotLink and Leech protection.